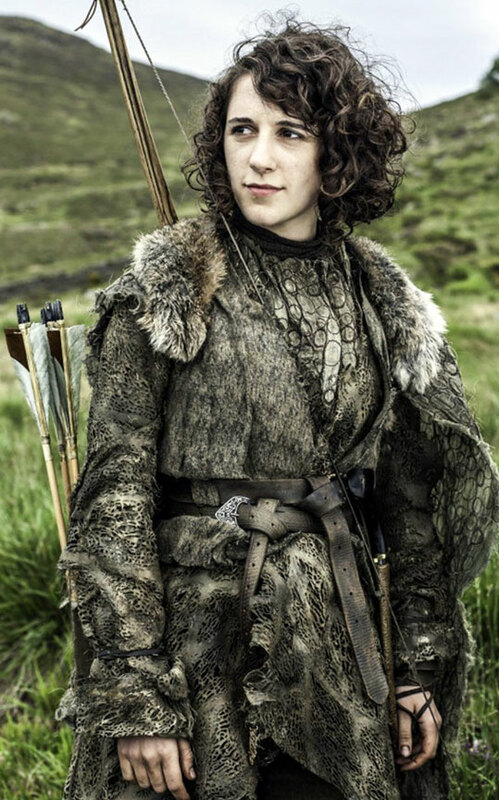 Believe it or not, I’ve honestly been trying to pace myself when it comes to obsessing over Ellie Kendrick, and was hoping to go a couple more posts before mentioning her again… but then someone went and asked her about the popular Game of Thrones fan-theory [POSSIBLE SPOILER?] that her character, ‘Meera Reed’, might be the secret sister of ‘Jon Snow’ (Kit Harington). To quote the Digital Spy interview: “I genuinely don’t have any idea as we don’t get told anything! I think people might just be thinking that because we’ve both got curly hair. In the books, our characters are described quite differently… Hey, I’d love it to be true because it would mean great things for my character, but I’m holding back on speculation for now. I think what’s been going on in George RR Martin’s brain is so much more a complex wormhole than we could possibly imagine. I think there’s definitely a mystery to Meera and Jojen and their parentage, but I think it’ll unwind itself eventually.” Of course, I’m not too bothered what her origin story is, so long as she gets plenty screentime in future seasons, and doesn’t die a horrible back-stabby death! Meanwhile, Ellie is currently appearing as ‘Christian’ in an all-female production of Cyrano de Bergerac at London’s Southwark Playhouse (Feb 18th to Mar 19th). Playing a male (romantic) role might seem like rather an odd idea to some actresses, but it’s meat-and-drink to her: “I went to an all-girls school, so it was always girls playing the boys parts and that’s how I got into acting, I played all the boys roles and realised they were often much better written than the female ones unfortunately! You don’t often get a chance, as a woman, to do sword fights and brawls! It brings something quite interesting to the play actually. I’m excited that this army is represented by a group of women, and I think that says something quite cool, and I’m excited to be a part of it. I always think that theatre is all about playing other people and the audience is ready to be told a story, and to see people transport them into a world as different characters. If you’re starting on that basis then it’s not that big a leap, really, seeing a woman play a man or a man play a woman or whatever. It works perfectly well for me.” Amen, sister! This entry was posted in Rants about Theatre, Rants about TV and tagged Cyrano de Bergerac, Ellie Kendrick, Game of Thrones, Meera Reed. Bookmark the permalink.